This annual report for UCSUR reflects the continued transition between former long-time director Richard Schulz and my appointment as interim director on September 1, 2016. Several of the accomplishments detailed in this annual report were initiated under Richard’s leadership, and I look forward to continuing the momentum he has built over the past 20 years and moving UCSUR forward during this exciting time. This transition for UCSUR also occurs within the broader context of evolving University priorities, as Chancellor Patrick Gallagher continues to implement his strategic vision. Several schools and units also are in leadership transitions; the new School of Computing and Information has been formed, and other administrative reorganization is occurring, including the appointment of a new senior vice chancellor for Research. I strongly believe that UCSUR is well positioned to adapt to potential changes, as we have always been opportunistic in responding effectively to evolving University and faculty interests and priorities. During the past year, UCSUR has produced more than 40 peer-reviewed publications, which have received approximately 5,000 citations; participated in more than 70 funded grants, the majority of which involve multidisciplinary collaborations; conducted more than 100 student trainings in the use of local policy-relevant data; and trained close to 2,000 students and health care professionals as part of the Geriatric Workforce Enhancement Program. The Center also has continued to be the go-to resource for data and analysis to inform regional public policy, with more than 50,000 Web visits to PittsburghTODAY, SWPA Profiles, and the Western Pennsylvania Regional Data Center (WPRDC). These resources contain more than 250 downloadable data sets and 500 indicators covering more than 20 topic areas. 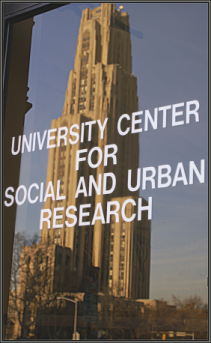 Other notable achievements include UCSUR’s receipt of a $3.2 million National Institute on Aging grant on financial decision making and susceptibility to financial fraud in older adults; continued collaboration with the Health Policy Institute on a regional caregiving initiative, including dissemination of the Pittsburgh Regional Caregiver Survey and convening a Pitt caregiver research summit; completion of an economic study of the impact of potential military base relocations and closures (BRAC) to inform state-level policy; and continued expansion of a new environmental policy initiative in the Urban and Regional Analysis Program. Finally, UCSUR continues to build its permanent research infrastructure with the capacity to conduct all types of survey research; obtain, format, and analyze spatial data; acquire, manage, and analyze large secondary and primary data sets; carry out regional econometric modeling; and carry out qualitative research. I hope this report will give you a sense of the value that UCSUR provides to the University and the broader community, and I look forward to continued collaboration during this new phase in the Center’s evolution.